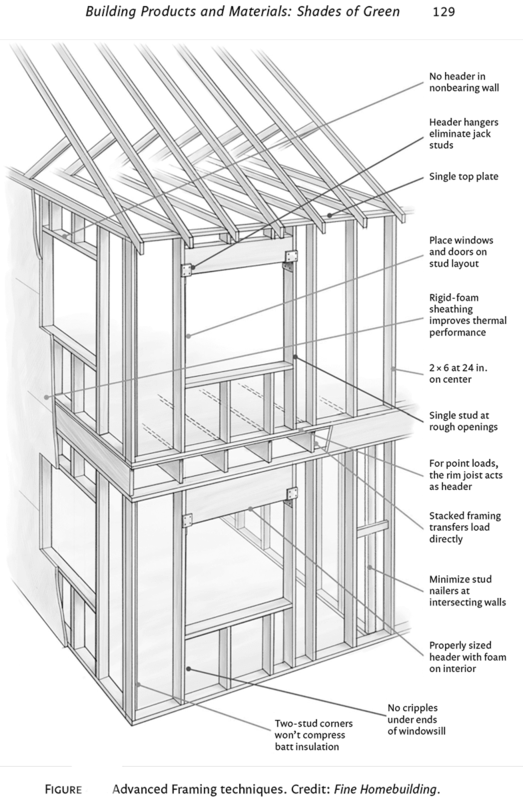 Optimal Value Engineered (OVE) or Advanced Framing techniques are framing techniques that use less lumber than conventional framing, yet are just as structurally sound. Using 5 to 10 percent less lumber is cheaper and faster because it uses 30 percent fewer framing pieces,21 which equates to a direct reduction in lumber package costs. But, as important, these methods also present one of our best opportunities to improve the thermal performance of the structure. Remember, thermal performance is one of our primary goals. Because Advanced Framing uses less lumber, this leaves more space in the cavities to allow for higher levels of insulation, resulting in better thermal performance. In fact, Advanced Framing results in a 75 percent improvement in thermal performance22 over standard 2 × 4, 16-inch-on-center framing. e lumber cost savings can add up to enough to cover the additional costs associated with improv- ing the thermal performance, including the cost of adding insulated sheathing to reduce thermal bridging through the wall assembly. This is definitely a case of “less is more,” in that using less lumber saves trees and uses less money in your budget, with the added bonus of leaving more room for insulation, giving more thermal performance. ink about that because it represents significant improvement in your building performance for minimal additional construction costs and lowers your long-term utility bills. So if you are planning a framed structure, you should make certain that your framing contractor has been trained in and practices the methods discussed here. required) and o en less than what it would have cost for 2 × 4 studs spaced 16 inches on center. Because there are fewer studs to cut, there is less waste. is also saves labor for both your electrical and plumbing contractors, who now have to drill fewer penetrations for mechanical runs. However, with most types of cavity- ll insulation (depending on climate R-value requirements), it may cost more to ll a 2×6 cavity than to ll the same structure framed with 2 × 4s. is is not only due to the increased depth of the studs but also to using less framing materials overall, so it will take more insulation material than it would have for the same depth, regardless. In addition, the added two inches of wall thickness will require extension jambs at all of the windows unless drywall returns are used. 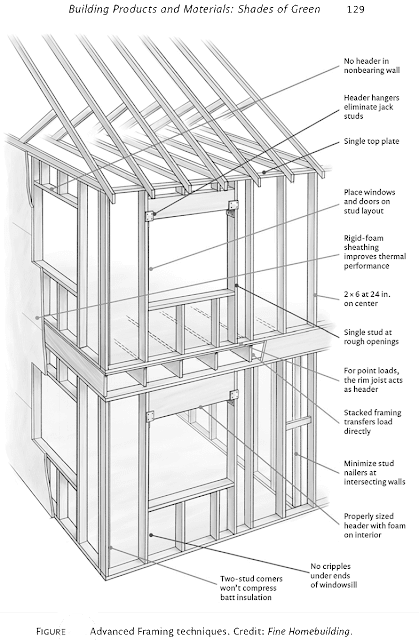 In-line Framing: Aligning the floor, wall and roof framing members directly above one another so the loads are transferred directly downward, requiring no additional structural support, can save considerably on structural engineering and framing costs. With in-line framing for improved load stability, double top plates can be eliminated because the load is distributed evenly through the remaining single top plate. Note that studs that are 24 inches on center are placed in direct alignment with floor joists spaced 24 inches on center and directly below roof trusses spaced 24 inches on center. e structural concept is to align all point loads to carry the weight directly down to the ground. Headers Sized for Actual Loads: Structural headers are o en over- sized or installed over all window and door openings, regardless of whether or not they are structurally necessary. When the size of the window used is specified in conjunction with in-line framing, headers are not necessary because no studs need to be cut. If walls are not load bearing, no headers are required over window or door openings. Having your structural engineer specify which areas will require headers, as well as the size of each header required, will save both materials and money. In most cases right-sized headers can be pushed to the outside of the framed wall assembly, allowing for insulation on the inside of each header cavity, which not only improves the overall thermal performance of the wall assembly but also eliminates thermal bridging at the headers. Note that it is possible and now required by code to insulate headers by using foam sheathing as a spacer in place of plywood or oriented strand board (OSB), either between or on one side (preferably the exterior side) of doubled headers. is technique uses scrap foam sheathing to reduce thermal bridging through the wood header. Two-stud Corners (California Corner) with Drywall Clips: is method of corner framing uses only two studs, saving material and providing space for additional insulation in the corner. To attach drywall in a two-stud corner, drywall clips are fitted onto the edges of the drywall before being attached to wood or steel studs. is eliminates the need for an additional stud in the corner to attach the drywall. Window and Door Placement: By aligning at least one side of each window and door to an existing wall stud, use of an additional jack stud is not necessary. If the window or door width does not completely ll the cavity and align with the next stud, you can attach the other side to the next stud with a metal hanger. is eliminates the need to frame additional studs to support the load transfer around these penetrations in the wall assemblies. Interior Partition Walls Intersecting with Exterior Walls (T-walls): Traditional framing addresses T-wall intersections by adding studs at each side of the partition solely for the purpose of providing a surface for attaching drywall. Ladder blocking between the exterior studs behind the partition wall uses two-foot scraps of lumber to provide the same supporting structure and allows for much better wall insulation and reducing thermal bridging. You can use scrap wood for ladder blocking, reducing the additional lumber you need to purchase. The case of "less is more" is quite practical because aside from the fact that it could improve the thermal performance and is less costly, a framing technique like this is best suited to a client's perspective both on warm and cold and seasons, thus lowering utility bills as being said. This fundamental element in frame building can contribute greatly for better structural engineering, just like what a civil contractor aims for its project. Great article!! Thank you for your post. This is excellent information. It is amazing and wonderful to visit your site. Here we provide our special one's.